Khwarezm Shahs. 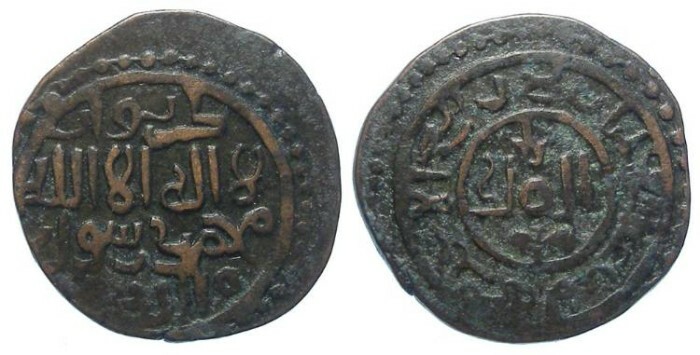 Anonymous AE Jital struck in AD 1221 while under seige by Ghingiz Khan. This type was struck in AH 618 (AD 1221), during the reign of Jala al Din Mangbarni (AH 617 to 628, or AD 1220 to 1231), and is dated to the Month of Rabi'II in that year. When this type first appeared on the market, it was thought they were issued by Ghingiz Khan, but it was later determined they were struck at the city of Kurzuwan during a period where it was under seige by him. This is one of the few know seige coin types of the Islamic period. Mint and Date: Kurzuwan, AH 618 in the month of Rabi'II. Reference: Album 1971. Tye 324. Size: 19.4 x 20.3 mm. Weight: 3.43 grams. Grade: VF with a fairly nice strike for this type. Obverse and Reverse: Islamic inscriptions.